Many of us go though life knowing that God loves us and trying to serve him by going to church, teaching Sunday school, leading youth group, and serving as a deacon. We set aside time to read our Bibles and to pray, and we teach our children to do the same. But some mornings we wake up wondering if we're missing something. 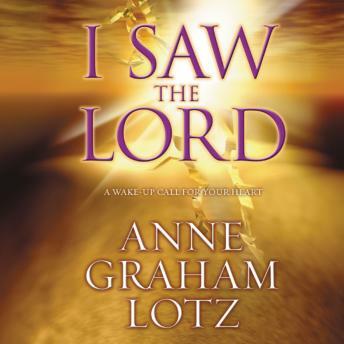 We know God with our heads, but we want to know him with our hearts.We long to see Jesus, but we don't know where to begin.Like many others, Anne Graham Lotz, the second daughter of Billy and Ruth Graham, has longed throughout her life to see the Lord Jesus, and to know him on an intimate personal level. Born and raised into a prominent Christian family, Anne knows that God doesn't have any grandchildren and that no one can ride into the kingdom of God on their daddy or mommy's coattails. So she has searched God's Word daily for a fresh touch of Jesus.I Saw the Lord invites you to undertake a journey with Anne, the journey to experience a fresh touch of Jesus by soaking in God's Word. Using the words of Isaiah, Anne shows us what we've been missing and why we need Jesus. She teaches us how we can see Jesus, who Jesus really is, and how to know if we've seen him.Chronicling her own and others' struggles to grow in faith, Anne shows the difference a fresh touch of Jesus has made in her life and the difference it will make in yours. If you're looking for more than religion and for more than a one-time religious experience, join Anne in reviving your life and in finding a relationship that will last a lifetime.